A new series of gigs in Brockley’s favourite DIY homebrew beer shop! Co-organised by Cath Roberts, Colin Webster and myself, each evening will feature three duos with each of us choosing a different partner each time. 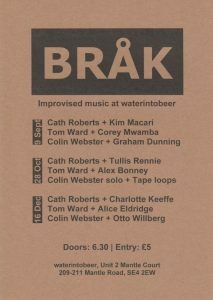 I’ve chosen a first outing playing with the venerable Corey Mwamba, and first duos with Alex Bonney and Alice Eldridge, both of whom have played in my Menagerie sextet. Looking forward to the music, and also the excellent beer…! This entry was posted in BRÅK, Collaboration on August 26, 2017 by tom.